Our boxer, Jack is a member of our family so we take his safety very seriously. Jack frequently comes along with us on our adventures so it is important to make sure that he is protected when outside with us at dusk or in the evening. Dog-e-Glow has a wide selection of stylish LED dog collars, leashes and harnesses to keep your dog visible at night. In fact, these LED lights are so bright and powerful that it can be seen from even 1,000 feet away. There are lots of great styles to choose from in collections including “Fashion” and “College”. I love the fashionable options including Green Camo, Pink Ribbon and the Peace Sign and for collegiate fans the Florida State University set is just one great idea. Jack looks very handsome in his Blue Doggie Bones Lighted LED Dog Collar ($24.99) and coordinating Blue Doggie Bones Lighted LED Dog Leash ($29.98). I love how Dog-e-Glow successfully blends fashion with safety in a high quality product that is designed to last. I was very impressed to learn that it has a 150 hour replaceable battery life with a 100,000 hour L.E.D. Life. It includes the original batteries and even comes with an extra set of replacement batteries so you are set to go when you purchase a dog collar and leash from Dog-e-Glow! 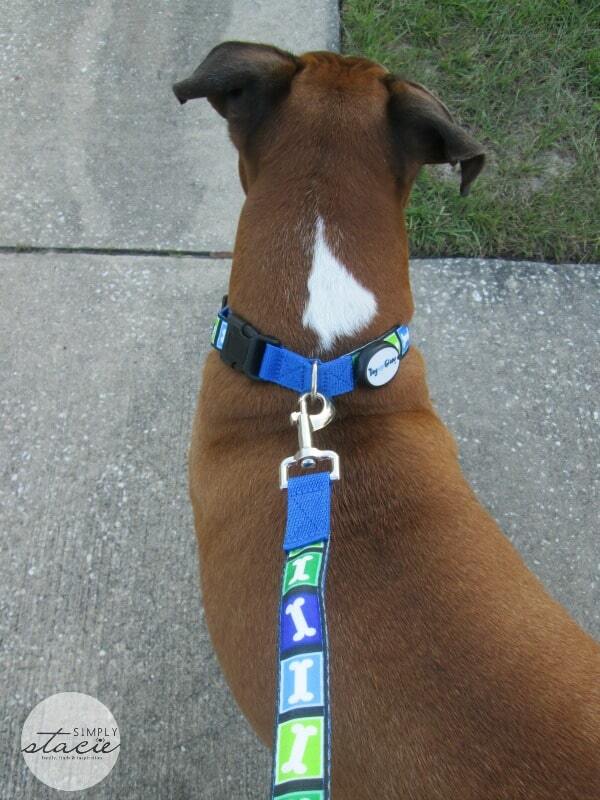 The collar and leash fit Jack very comfortably and he enjoys wearing it on his evening walks and other adventures. 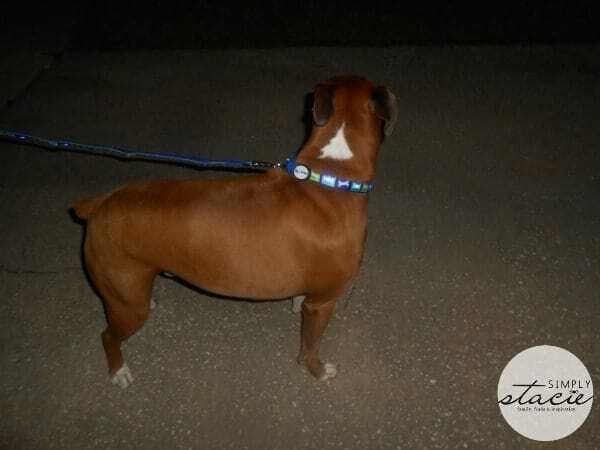 For example, we like to take Jack on camping trips with us but it can be hard to keep track of him at night…….that is no longer a problem when he is wearing his Dog-e-Glow dog collar because we can set it to a steady glow and know where he is at all times. There is also the option for the flash mode which is great when walking Jack through our high traffic neighborhood at night. We have actually observed cars at a distance start to slow down as they approach us and some drivers even give us the thumbs up when they see that the flashing lights are Jack’s cool collar and leash set from Dog-e-Glow! You are invited to visit Dog-e-Glow to browse the entire collection of dog collars and leashes. 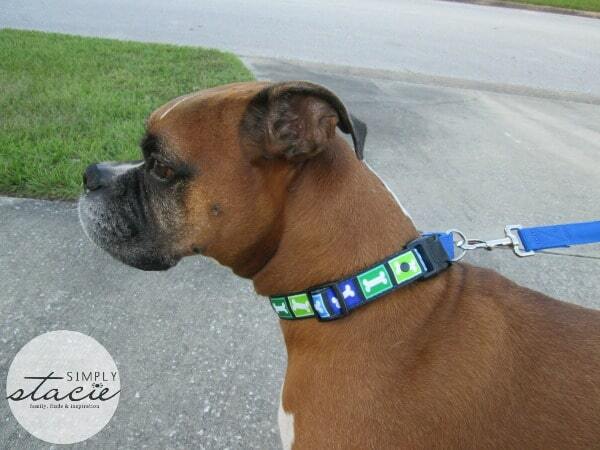 The dog collars are available in specific sizes and can be adjusted for the perfect fit. The leashes are a nice 5 feet in length giving the dog plenty of room to move around. When you purchase a collar, leash or harness from Dog-e-Glow you can feel confident that you are getting a high quality product that is designed to last, it looks fabulous and most importantly your pet will be highly visible and safer at dusk and in the dark. Which style do you think would look awesome on your dog? Pink camo would be cute on my puppy! I love the Eat, Play, Love Lighted LED Dog Leash! I like the leopard print one but if i win i will let my mom pick for her lil girl.